I believe the shipping info will be updated after the chinese holidays,as the shipping partner also have holidays untill tomorrow. Just tried to track my package again. It seems it has been sent by HongKong Post,and our national post (Postdanmark) writes that the shipment has been startet in the country of sender on the 6 october. Edit 7 october: Package has left china. Mine is still the same, it hasn't shipped from China. so shipped out before holiday but No really just sent to the logistics company, where are the units please. So I guess there's hope! Wolly Xu why when put my order numerber to http://vidon.me/order_track.htm Sorry, no order tracking info. Hi, due to some unexpected reasons, we have changed the shipment way. For more details, please read this notice. No I never change the shipment way my order numer is 31587543. I'm a little confused... here's my tracking info. My box is coming as originally shipped? When I track on usps.com, it continues to show "not found". Once it clears customs then the USPS tracking should start working if you are lucky. Depending on your location the USPS tracking might start working on the day of delivery to you. I just noticed that my package is in the US. 2014-09-26 22:28:29 Shenzhen Sent to CUE processing center on 2014-09-26 22:28. 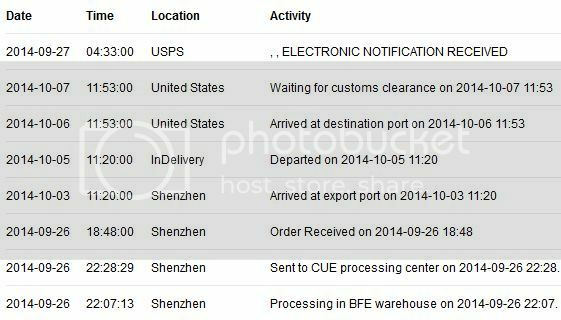 2014-09-26 22:07:13 Shenzhen Processing in BFE warehouse on 2014-09-26 22:07. I kept seeing: ELECTRONIC NOTIFICATION RECEIVED dated 2014-09-27 and I thought that was the last point check and that it was stuck, when it actually started shipping on the 5th of October. 2014-09-28 11:33:08 Shenzhen Sent to HTM processing center on 2014-09-28 11:33. 2014-09-26 19:47:20 Shenzhen Processing in BFE warehouse on 2014-09-26 19:47. Just got back from work,my VidOn-boxes have arrived,i ordered 2 and recieved two separate packages. Lucky me, no problems with the customs,each package was marked as "gift,and value as 15.00 *1 ",and i did not have to pay the postman anything. Normally they charge for each package that has to go through the customs. Now i known what to do this weekend (when i get the time). Hope the rest of you will get your boxes soon,sad that the logistics-partner has problems with their shipments. My box has also arrived. But has been held back because of incomplete addres. I wrote to support. Hopefully i will get an answer what to do. Mine was not actually sent and it is a real pity for testers get their boxes after direct customers do... Pretty strange, sounds like a bad planning. @Alex: I totally agree since I am in quite the same Situation. 2014-09-26     22:28:29     Shenzhen     Sent to CUE processing center on 2014-09-26 22:28. 2014-09-26     22:07:13     Shenzhen     Processing in BFE warehouse on 2014-09-26 22:07. But, when tracking via the supplied USPS #, still "Not Found". Odd.